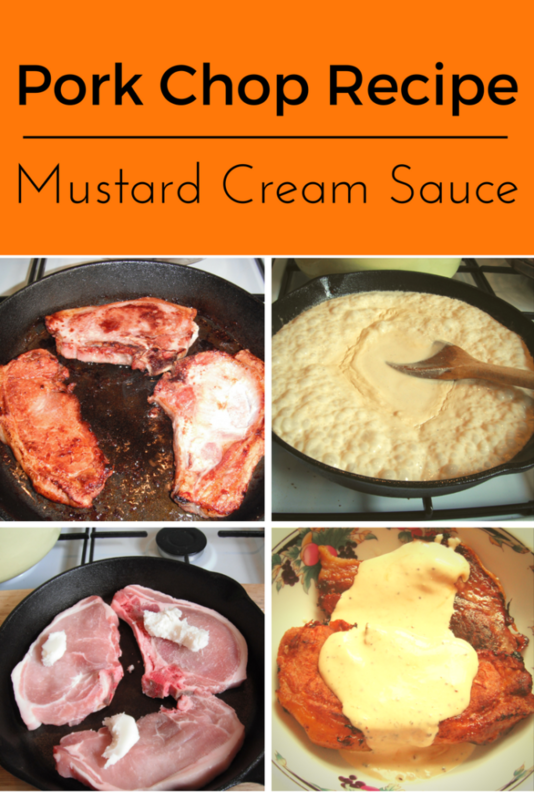 Here is a quick and easy pork chop recipe that would be perfect for a weekday evening supper. This recipe is easy because the pork chops are cooked in the oven, freeing up time for other chores etc. The sauce is made in the skillet the chops were cooked in, making less washing up. If you have a cast iron skillet then I would use that, but don’t worry this recipe will work with any oven proof pan, you don’t really want the sides to be too deep, otherwise it will take ages for the chops to brown. Season the pork chops well with salt and pepper on both sides. 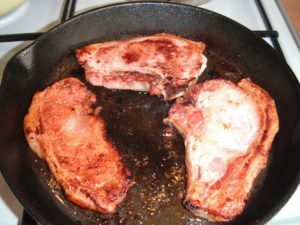 Place chops in the cast iron skillet dot with lard. I only had room for 3 chops in my skillet! So I had to put one chop in a separate baking dish. Cook in the oven at 375 F or 190C until the fat is browned and the meat is cooked around 30 minutes. Remove the chops to a warm plate. Tip out the fat from the skillet. Place the skillet onto a burner and deglaze the skillet with the chicken stock (deglazing is using the stock to dissolve all the cooking juices and caramelized pieces from the bottom of the skillet). Jump to number 7. if you don’t have a pan that can go on a burner. When the stock is bubbling add the cream and grain mustard. Bubble until the sauce is thick and creamy. Pour sauce over the pork chops and serve. If you don’t have a pan that can be placed on a burner, once out of the oven, just make the sauce in a saucepan. 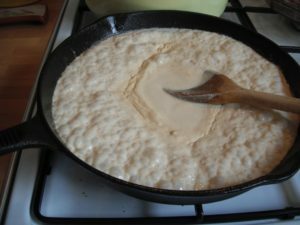 You can easily achieve this by heating up the stock in the saucepan, then once boiling, add the cream and mustard, and bubble for a little while until thick enough to coat the back of a spoon. I like to serve this with steamed or boiled greens, for example, savoy cabbage or kale for a delicious low carb meal.